By far the merriest place in Carberry, James White’s gingerbread house, built circa 1900, occupies a prominent corner on Carberry’s south side. Contractor and inventor James White built it to reflect his Ontario heritage where Queen Anne style developed its own permutations. Fanciful yet formidable, subtlety and exuberance unite in striking accord in its expansive harmony and superb craftsmanship. The picturesque roofline features double gables with a shallow pitch between them. Under the gables, bull’s-eye windows are perfectly centred between substantial brackets, each of which features a delicate drop. The peaks of the gables contrast with the smooth arc of the bargeboard below. 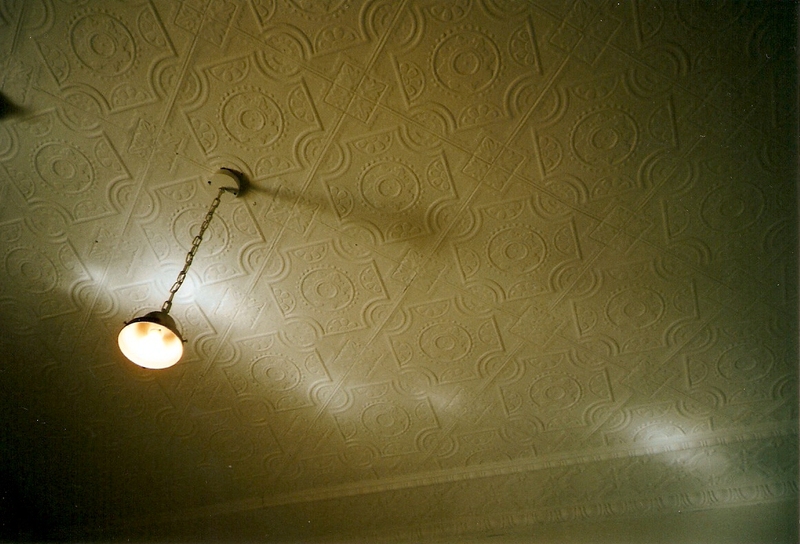 The design on the elaborate bargeboard, the triangle and dot, is replicated on the upper verandah. The colours are intoxicating. The distinctive red brick has developed a lovely patina over the century that accentuates the contrast with the rich white brick detailing. 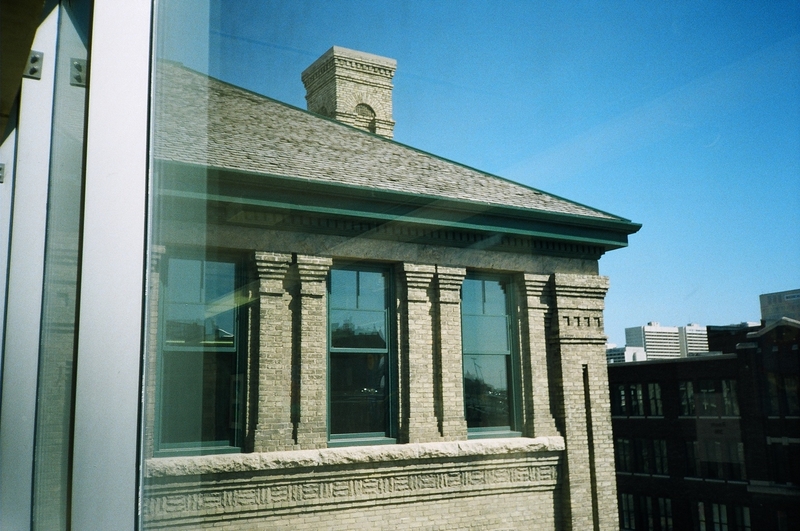 All windows are topped with elaborate headers in white brick, each with a drop, like on the brackets. Two belt courses in white brick gird the house and the bull’s-eyes are accentuated by the solid white brick enclosures. Every corner is loaded with white brick quoins. Notice the subtle use of the colour black on the building in the small details on the verandahs, window sills and lintels and under the gables. Though I could describe its detail for pages, this is a must-see-for-yourself place. 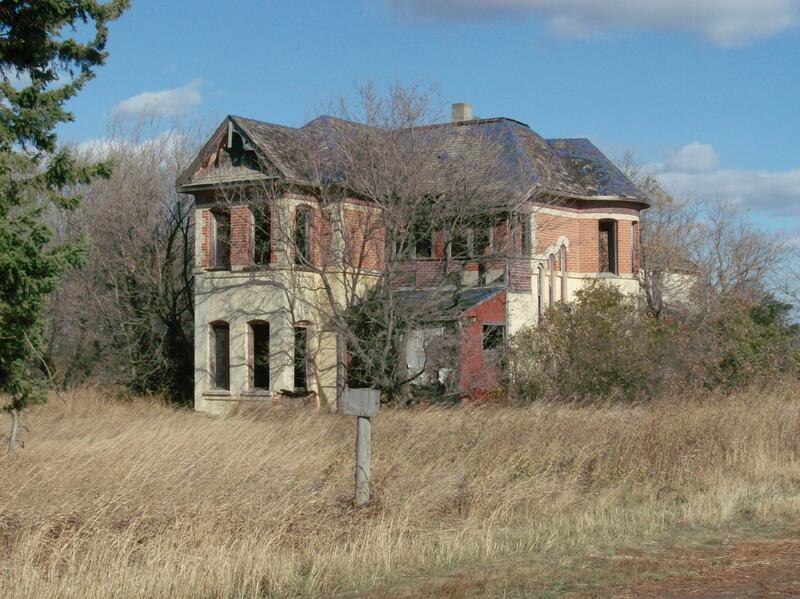 Now part of the Carberry Plains Museum, guided tours inside the house are offered in the summer months. I’ll tease you with my four and a half minute video tour of the house inside and out. 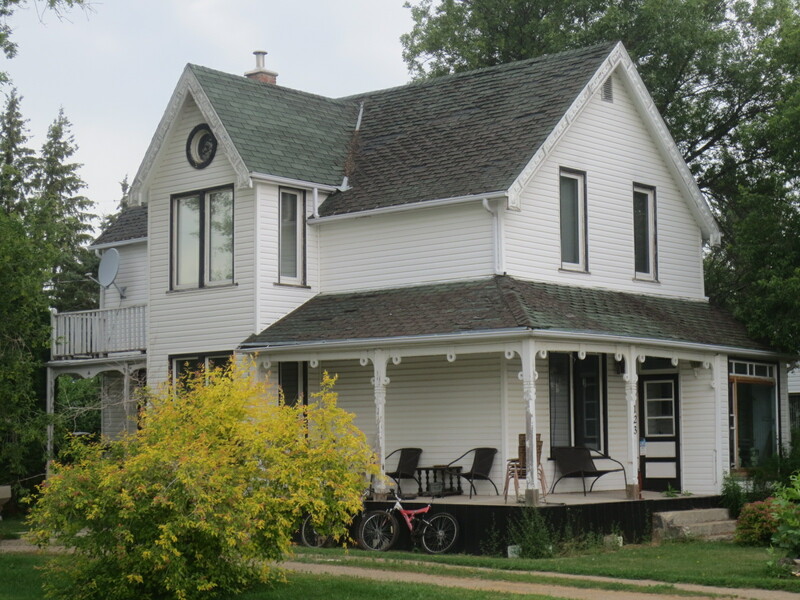 The Carberry gingerbread house is one of only three houses with that design in Canada and the only one of the three still standing, making it extra precious. Charming Queen Anne style details make this a local treasure. Built about 1910, this red brick one-and-a-half storey home is notable in Carberry for its use of gingerbread elements like the scroll and bracket work on both the upper and lower porches, striking against the red brick. The bricks are laid in standard running bond. The facade window in the vestibule has coloured glass, original to the house. Its floor plan is unique in Manitoba. 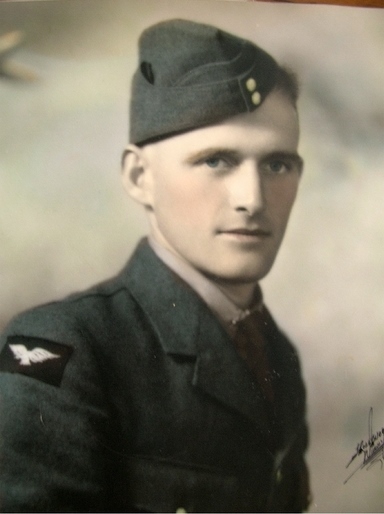 The first owner was Joseph Mack who was a school trustee and municipal councillor. At one time the house was a duplex. Typically in small towns, before there was a power distribution grid system, early electricity was generated by a local power plant. Carberry’s first electricity plant began supplying power in 1907. A notable family built this lovely wood frame house in 1897 using a basic design enhanced by elegant Queen Anne style detailing. The expressive use of woodwork on the porch especially on the pillars and bargeboard along the gable end turns a common house plan into a heritage delight. The porch continues at the rear of the house with a second floor balcony. 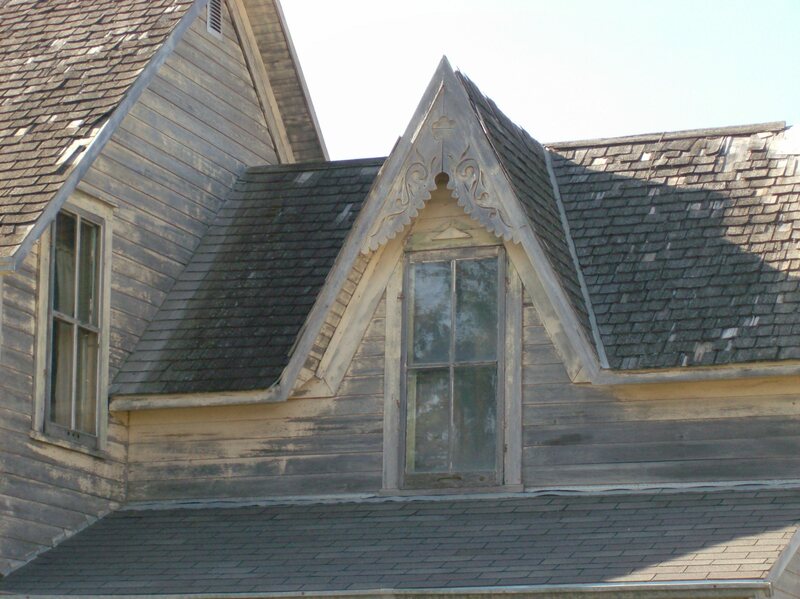 Notice the inset bull’s-eye window under the side gable. In 1890 Carberry separated from the municipality and incorporated as a village. Its first mayor was W. W. Ireland who ran a lumber and coal store. 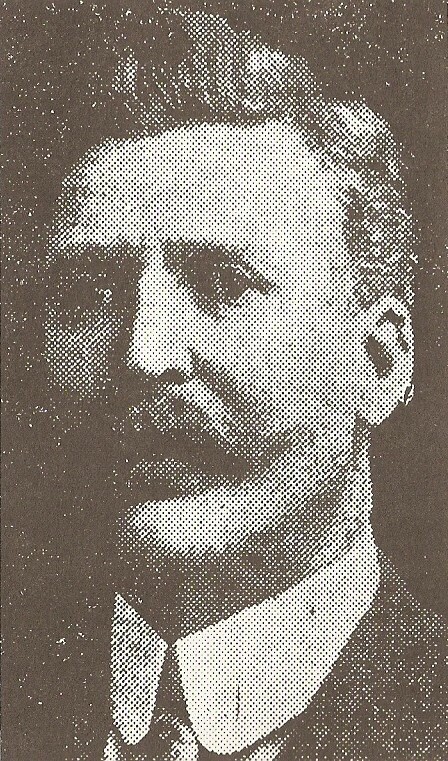 Robert Fern Lyons was an early settler in the Carberry area who owned 2700 acres of land and raised crops and livestock. 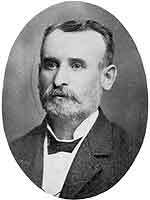 A Conservative, Lyons was elected to the Manitoba Legislature five times between 1892 and 1914. Lyons built his mansion just outside of the town. Though long abandoned and disintegrating quickly, the crumbling mansion retains enough of the detail to suggest its original magnificence. Built around 1895, the red and buff brick two-storey house combines elements of Italianate and Queen Anne architectural styles into a striking and luxurious pile. The first floor features buff brick, the second floor red brick, both laid in standard running bond. The commingling of both coloured bricks on the second floor is fluid and dynamic. The asymmetrical massing of the house, round segmental arches over the windows and the accent quoins are all Italianate elements that give the house a villa feel. Queen Anne style is represented in the two-storey rounded rooms, the bargeboard and fish scale shingles on the gable ends, the ornate three arched windows, which open into the stairway, and picturesque roofline. I suspect this place will be torn down soon. Watch my 3 minute video tour of the shambles inside the old mansion. Carberry and North Cypress Rural Municipality are Spud Country. Every year local farmers plant and harvest about 20,000 acres of potatoes, much of it processed at the nearby McCain Canada plant. 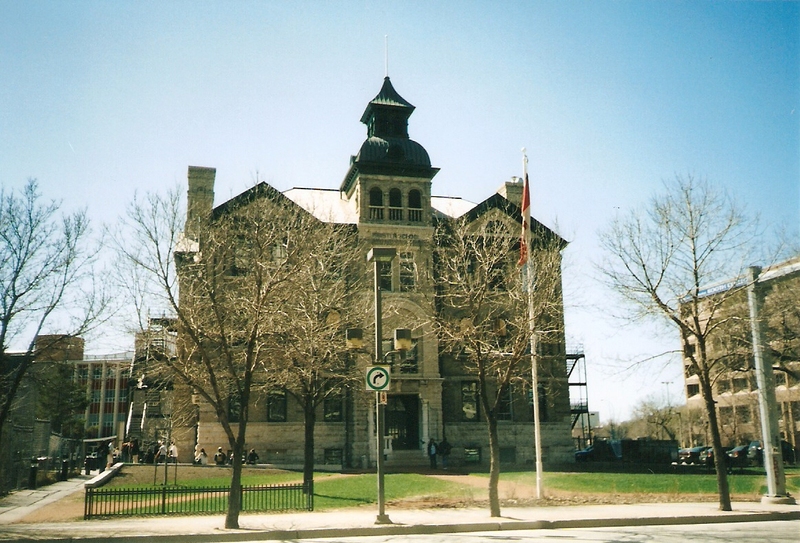 I began this series on Winnipeg’s grand old schools with Earl Grey School due its unique position in my development. The rest of the schools will be offered chronologically by the year they were built, starting with an overview of Winnipeg as the 20th Century began. The new millennium brought radical changes in the way we travel thanks to the Wright Brothers, Henry Ford and the creation of General Motors. The new era of transportation began in Winnipeg with the first “horseless carriage,” reputedly owned by Professor Edgar Kenrick, appearing on the streets in 1901. Other than bicycles and electric streetcars, horses were the major transportation mode. 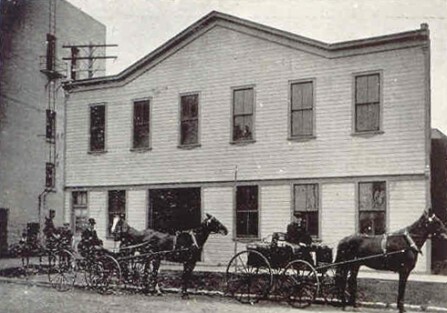 Livery stables abounded (there were nine of them on the south side of Portage between Main and Donald in 1905) as did blacksmiths, harness makers and sellers, and horse troughs. To house their trade, carriage and harness companies built massive multi-storey buildings in what is now called the Exchange District. Great West Saddlery Company’s two buildings at 112-114 and 113 Market Avenue are fine examples. By 1905, there were a dozen “benzene buggies” which, as they passed, often elicited shouts of “Get a horse!” from bystanders. 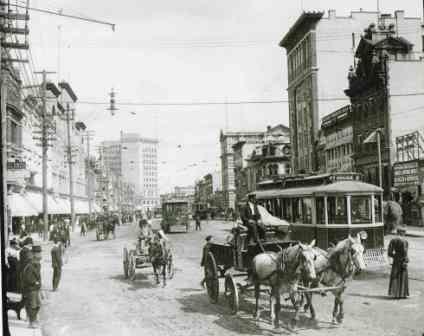 By 1910, cars were a common sight on Winnipeg streets. The last horse trough, dismantled in 1952, was across from City Hall. The T. Eaton Company opened their huge Winnipeg store in 1906 and the Redwood Bridge opened in 1908 providing further access to the Municipality of Kildonan. 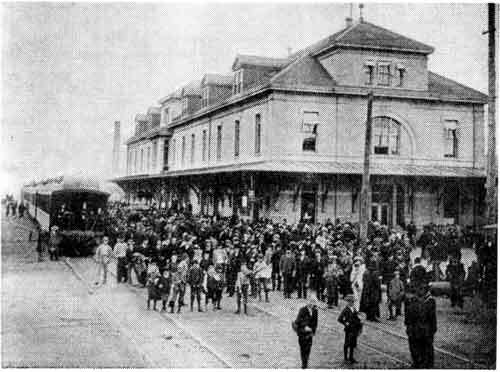 Largely due to European immigrants, many of whom lived in the Dagmar District, by 1900 Winnipeg’s population had grown to 40,000, to 100,000 in 1906 and 213,000 in 1913. This rapid growth challenged school systems. In this decade, at least 27 schools were built, very few of which remain standing. During this period, new curriculum concepts developed to educate the influx. Innovative ideas like William Sisler’s direct method of teaching English, night schools and Household Arts (Home Ec) were introduced. 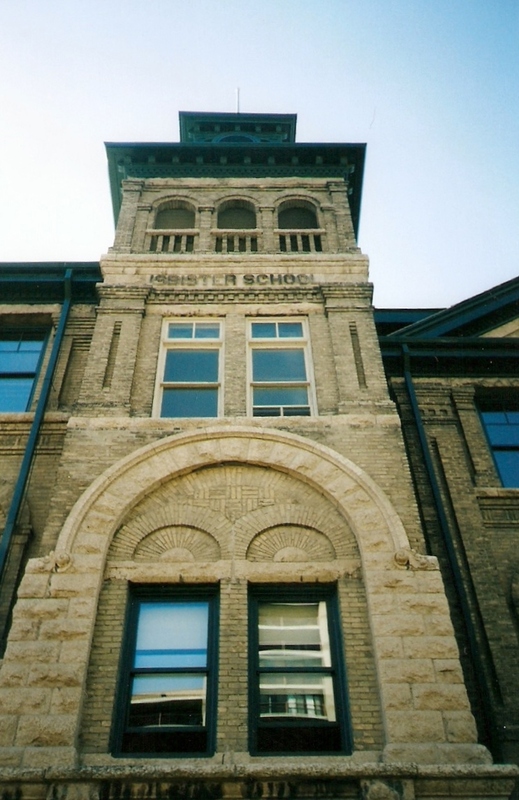 The oldest public school in Winnipeg and the last old downtown school sits rather anonymously, preciously on Vaughan Street, just north of The Bay. In fact, the land Isbister School stands on once belonged to the Hudson’s Bay Reserve. 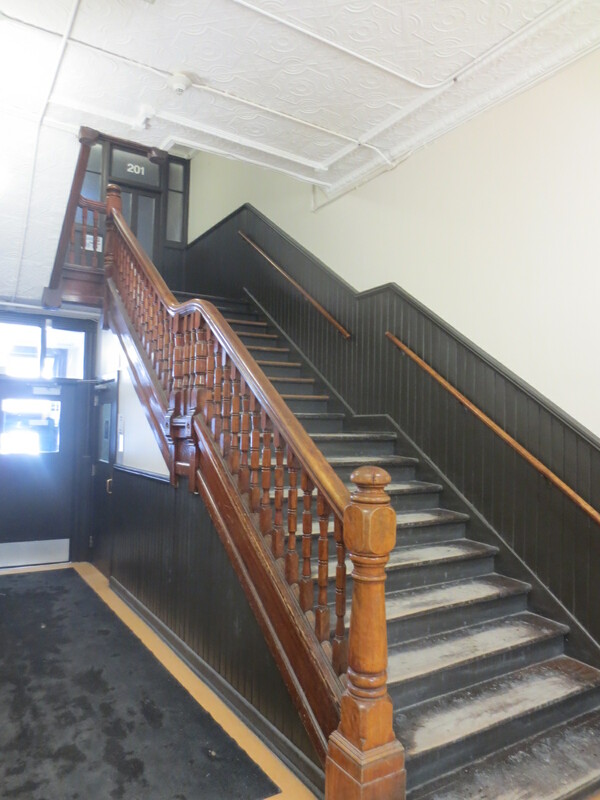 To accommodate the school the Board purchased a block of lots at $100 each from the Hudson’s Bay Company. To assure good water, one of the major challenges in the city’s early development, a 160 foot-deep well was dug. 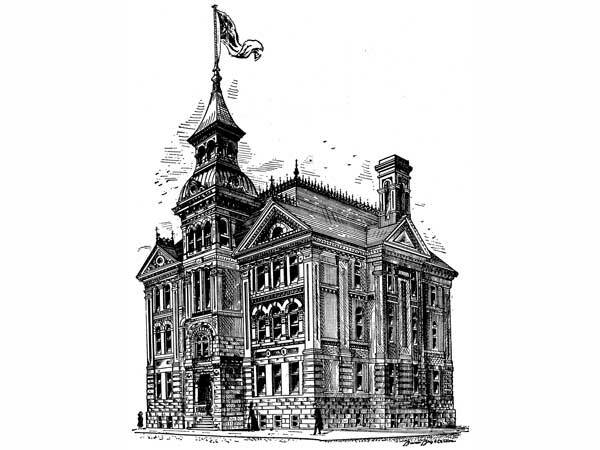 On June 14, 1898 , the contract for a ten-room, three-storey building was let to the construction firm of Sutherland and Wood at a cost of $29,336. Construction began one week later. 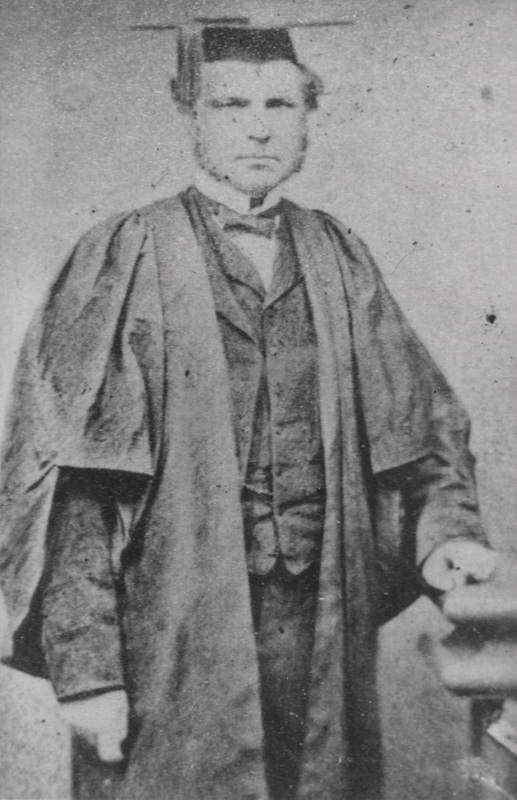 Architect Samuel Hooper supplied the plans. 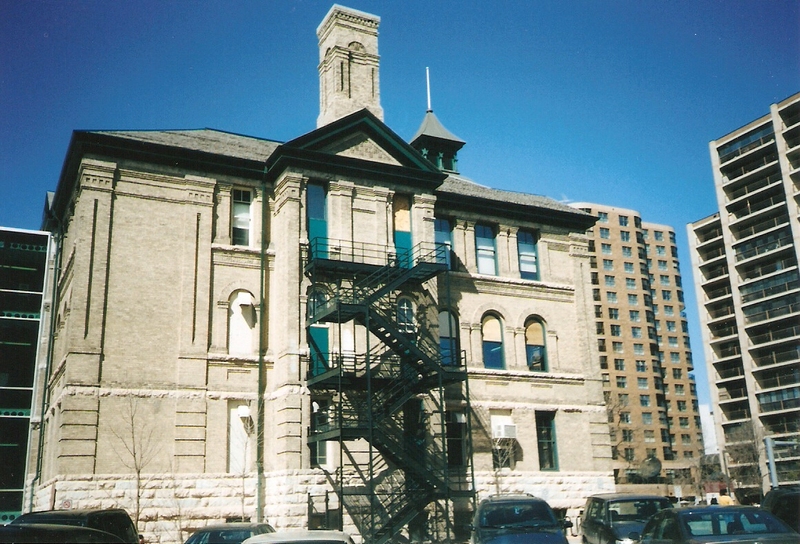 In the architectural drawing of Isbister (above), you can see Hooper’s intent was to employ Queen Anne style architecture, an eclectic style used mainly for residential buildings in Winnipeg. This makes any public building using the style particularly special. By early November the brick work was nearly up to the top of the third storey so construction was rushed to get the roof on before winter. On January 5, 1899 the new Smead-Dowd Heating System was fired up to provide warmth for the interior plastering. The interior work was handled by C.W. Sharp. For a number of reasons, some inadvertent, in Isbister School we have an extremely well preserved example of fanciful Queen Anne architecture on a public building. Delightfully, despite the recent addition, we can still experience both the exterior and interior more or less as it was when Hooper brought it forth from his imagination. The school has many striking features: its picturesque roofline flowing from a medium-pitched hip roof into large gables on every elevation, richly detailed chimneys that bracket the building and an unusual entry tower with multi-tiered, pagoda-like cupola. The school measured 75 x 81 feet (22.7 x 24.7 m) giving it 6075 square feet (561 sq. m) on each floor. The entry tower induces a feeling of ascension beginning with the ground-level steps that lift you into a landing in a small pavilion bracketed with columns and an elaborate rough limestone surround. A short balustrade in sandstone at the landing off-sets the entrance and appears to be an after-thought but it is included in Hooper’s original drawing. 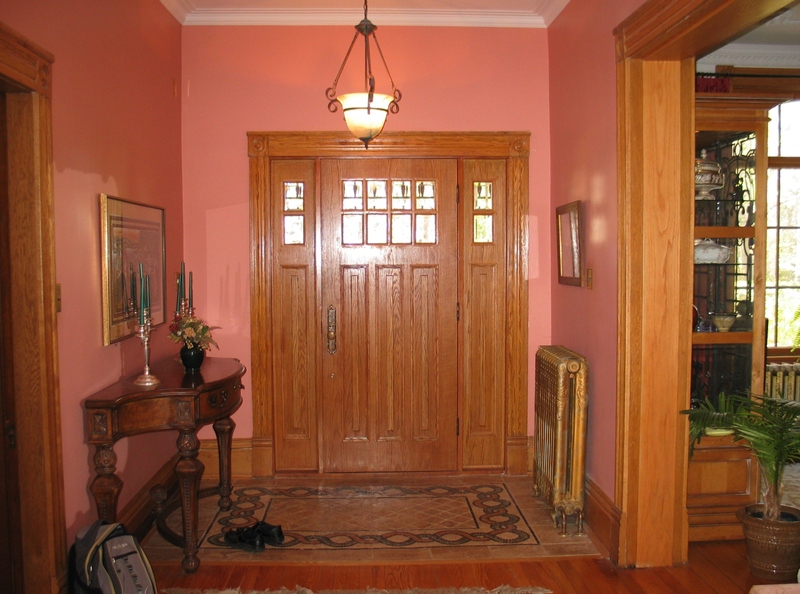 Beyond, large double doors invite you inside. Above the entry, a wide graceful limestone arch embraces a pair of rectangular windows, each capped with a limestone lintel and linked brick arches. Note the brickwork (cross-hatching, sunburst) that infills the large arch above the windows includes a ghost arch. Upward, just above a stone belt course, another pair of rectangular windows with stone lintels are bracketed with pilasters and surmounted by a dentil then the school name carved in stone. The tower that extends above the roof has an open arcade of three arches with balustrades along the front and a single window one each side executed in rough stone. The first roof above an extended cornice is a foursquare convex design with round hooded windows. The cupola is composed of a short square section with a blind arcade of hooded arches in every direction. Above heavy brackets, a concave roof ends in a pinnacle, a peak and a flagpole. The highly accomplished craftsmanship on the entry tower in both stone and brick lives up to the expectations of Hooper’s plan. 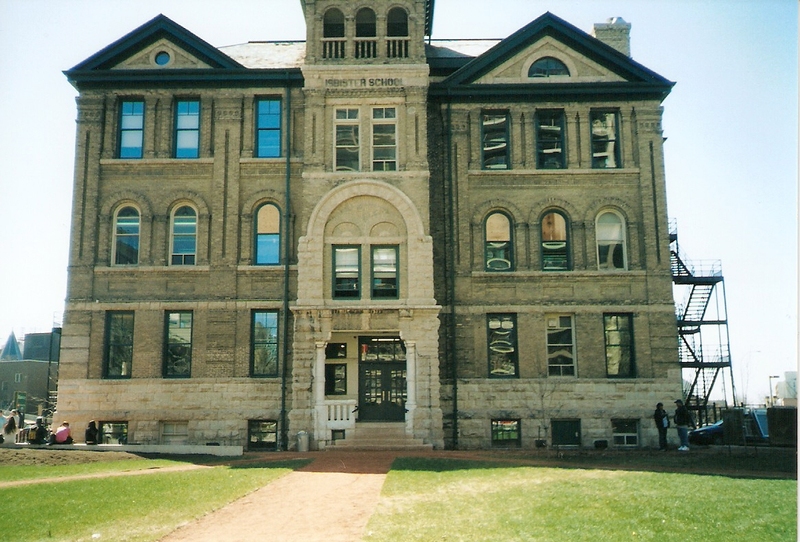 Similar to British Board schools, which were usually three-storeys, square with boxy massing, Hooper built his design on a tall foundation with stone up to the sills of the first floor windows cut by low rectangular windows. There are two different stones used in the school’s high foundation. Typical Tyndall limestone alternates with paler sandstone. The brickwork on every elevation is highly decorative and expertly executed. In this regard, notice the brickwork around its wide variety of windows and openings, the tops of the pilasters and the chimneys. The subtle asymmetry of the front facade is balanced by the fenestration. Three rows of windows adorn the front facade. Notice the first and third floor windows are rectangular but the middle row has arched crowns to complement the large central tower arch and the three arches it encloses. The gables denote where the pilasters divide the facade. The smaller south (left) gable covers just two rows of windows while the larger north gable covers all three rows. The school originally had ten classrooms, four on the first and second storeys and two on the third, shared with an assembly hall that was later converted into two additional classrooms. The classrooms were spacious and well illuminated with cloak rooms in each room and blackboards and carved wainscoting along the walls. Colourful stained glass panels with magenta and blue floral motifs filled the transoms. Adjustable desks (right) were attached to the maple floors. 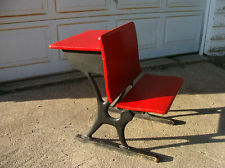 These cast iron and wooden desks were made by A. H. Andrews Co. in Chicago and were called desk benches due to the combination of chair and table. In the basement, the school had a playroom; we’d call it a gymnasium. The character of the finishing, the pleasant effect of the colouring in the furniture, walls and ceilings has an important value as one of the educational influences by which the children are affected. With no museums or picture galleries or other agencies for the cultivation of taste and promotion of art amongst us, it is important that the school should not fail in its duty in this respect, for no educational agencies have greater claims on the ground of utility alone than those concerned with the education of taste. As you can see in this picture postcard of Isbister School (below), it once had wrought iron filigree cresting along the roof peaks and metal fire escape slides on the north and south sides. 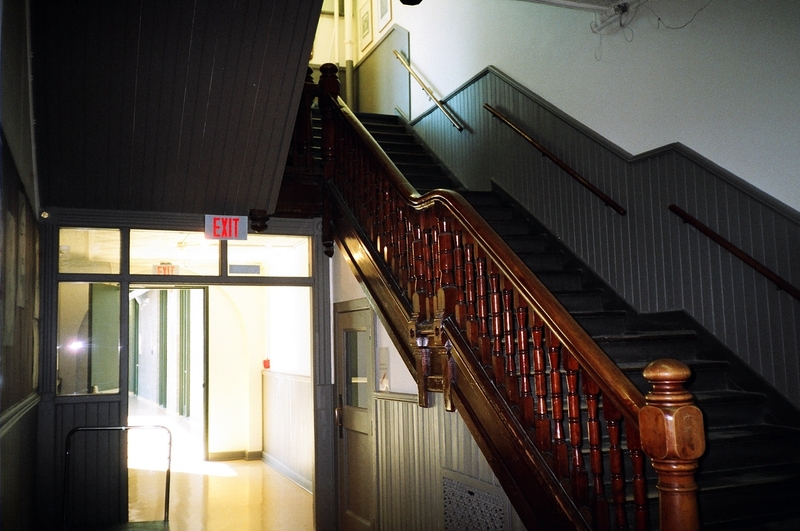 The slides were installed in 1907 and could evacuate all students in less than two minutes. 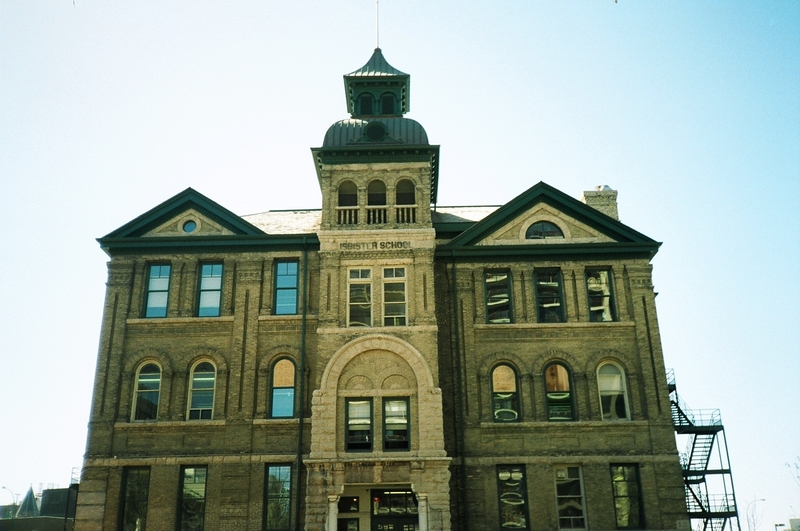 In August 1909, the British Association for the Advancement of Science held their convention in Winnipeg. Isbister along with Carlton (at Carlton and Graham) and Alexandra (at Edmonton and St. Mary) schools were pressed into service for meetings. Delegates must have felt right at home in buildings similar to ones they attended in England. By 1939, lip-reading classes for the deaf were offered at the school. Though the post-WW2 baby boom helped fill some desks, demographic changes downtown and sliding birth rates meant ever-dwindling enrollments. On June 30, 1964 Isbister School closed its doors and it seemed inevitable the old place would be demolished. Not to be! 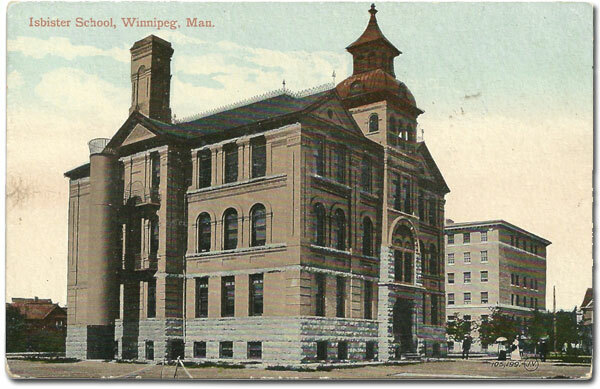 Isbister School received a reprieve when it became the Winnipeg Adult Education Centre (WAEC) in September 1967. Eleven years later, enrollment was so large that portable trailers parked around the school handled the overflow. Today WAEC provides high school education in Grades 9 to 12 to mature students, ESL and computer classes. Current enrollment is about 900 pupils with a staff of 45. In 2004 the steel, glass and concrete L-shaped addition, designed by Penner Prins Architectural Collaborative, was built onto the west side. Structural work was done by Wolfrom Engineering at a cost of $2.5 million. From the third floor, the addition offers some stunning views of downtown. While an incongruent juxtaposition in design and materials, somehow the addition doesn’t detract too heavily from the old building, a testament to the timelessness of Hooper’s design and the empathy of the modern architects. Luckily, the Vaughan Street façade retains its 1898 face, glorious even with pollution-darkened brick and stone. The experience of entering the new addition from inside is like passing through a time warp. (right) Surrounded by rich wood and arcane designs with creaking floors beneath, at the end of the hall is a blinding white glow, the doorway into the 2004 addition. The floor of the addition is concrete and feels as if it’s vibrating. The wall of glass is not connected to the floor, the space between the floor and the window contributes to a mild sensation of vertigo. The view of the upper brick detailing on the old school from the addition is spectacular! In the above picture, notice the visible section of the chimney with its dentil, sunburst arches and belt courses. Wow! There is a matching one on the north side of the building. Now move down to the dentil under the building’s eaves and the exquisite brick and stone work thereafter. Note the cross hatch carved in limestone under the rough stone sill. The south facade of Isbister shows a fine view of how the chimneys are incorporated into the exterior design. Bracketed by exits on every floor, the elaborate chimney protrudes out of the top of the gable. Wide metal stairway fire escapes have replaced the spiral metal slides. The north side reflects the south in design. The grey wall on the right is the north side of the 2004 addition. I like this shot for the contrast between the old and new school and apartment buildings beyond. 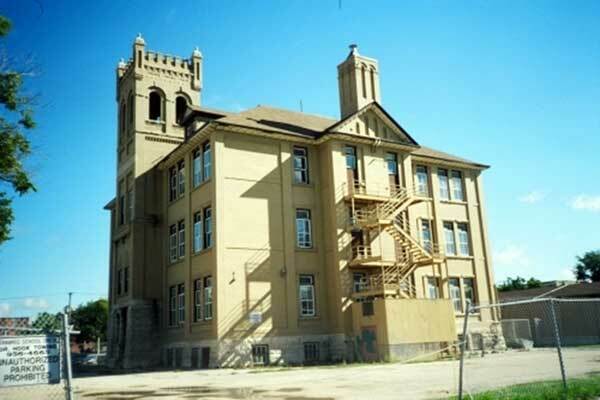 The school is named for Alexander Kennedy Isbister, the son of Orkneyman Thomas Isbister and Cree Mary Kennedy, born in 1822 at Cumberland House on the Saskatchewan River. A smart and promising student, at 16 he became an articulated clerk with the Hudson’s Bay Company. Later he studied at universities in Scotland and England becoming a lawyer, teacher and writer, completing 21 textbooks. He died on May 28, 1883. 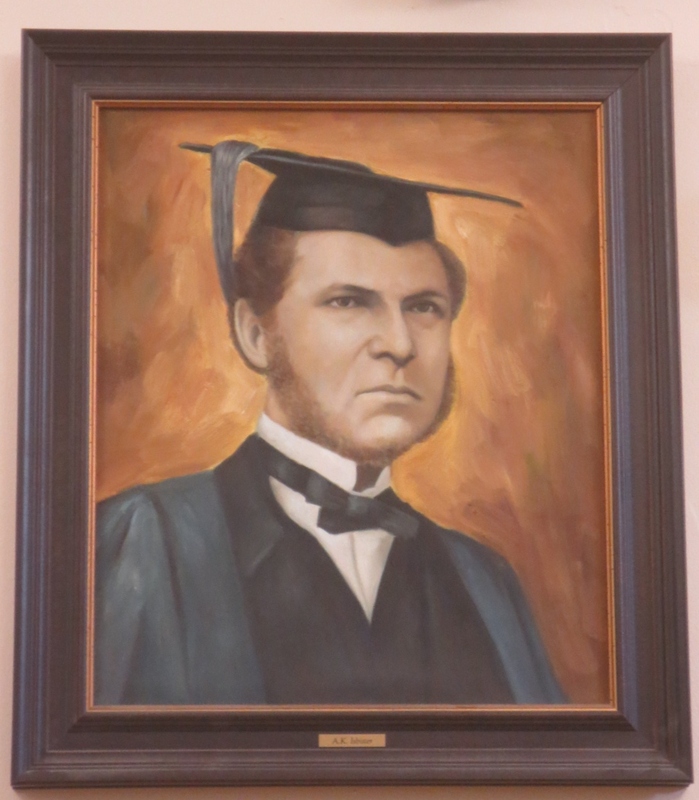 A strong supporter of the Red River and Northwest regions, Isbister established a scholarship fund still offered to undergraduates at the University of Manitoba though now paid for by the province. 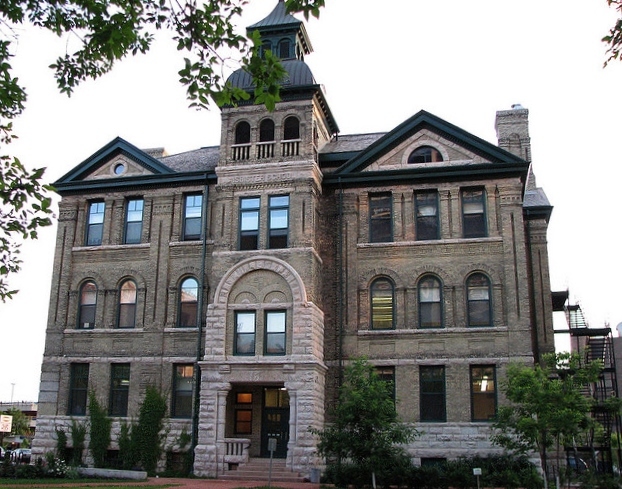 Isbister bequeathed his 5,000 volume library to the U. of M. Regrettably, most were lost in a fire in 1898. 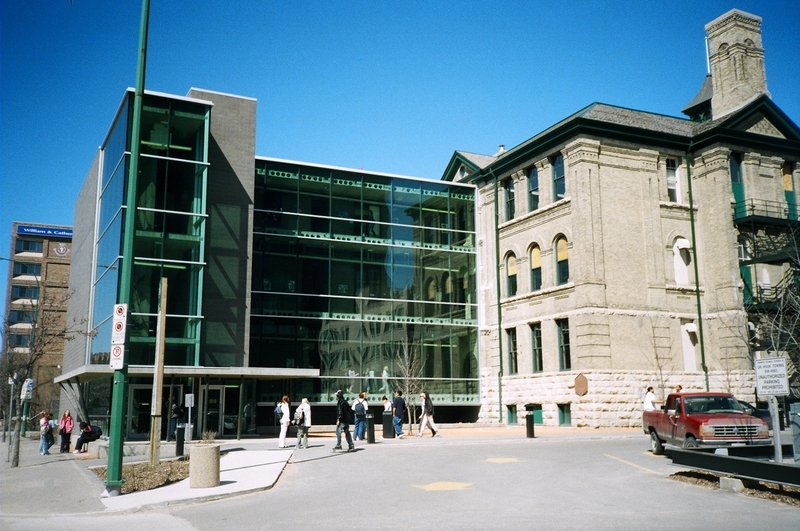 In addition to the school, he is commemorated with Isbister Street and the Isbister Building at the U. of M. Fort Garry campus. Isbister School’s designer, Samuel Hooper, became Provincial Architect in 1904, a position he held until his untimely death in 1911. In addition to designing Isbister School and St. Mary’s School (1904), he created plans for the Carnegie Library (1903-05) and Normal School (1906) on William Avenue. 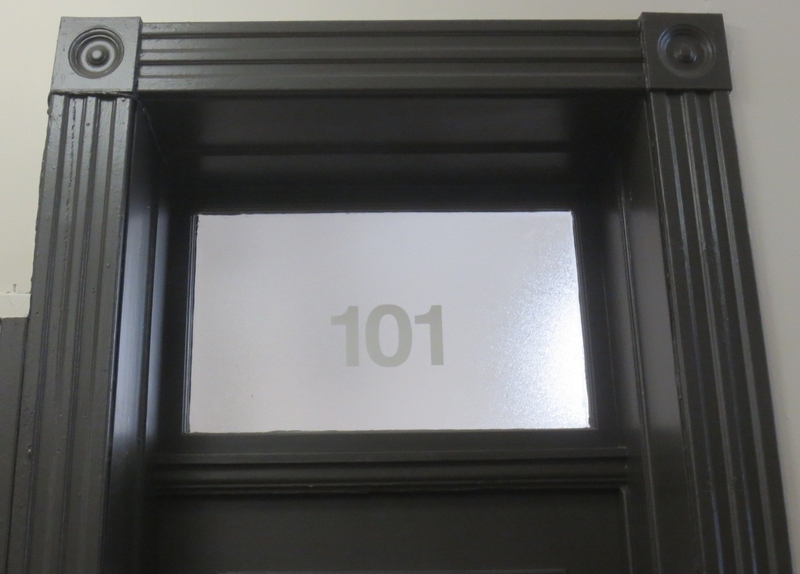 In his role as Provincial Architect, he created three designs for Department of Education one-room schoolhouses in 1903, which were replicated all over rural Manitoba; Land Titles Buildings in Neepawa (1906) and Portage la Prairie (1906), and Courthouses in Brandon (1908-1910) and Morden (1905). Among Hooper’s last designs, in fact one completed by his successor V.H. 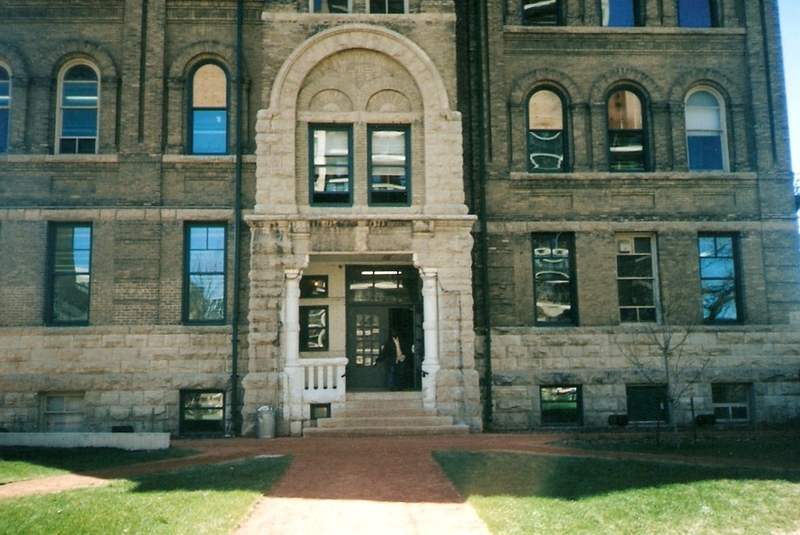 Horwood, was the University of Manitoba Administration Building (1911-12) on the Fort Garry campus. Another prominent figure in the story of Isbister School is Daniel David Wood, (left) of Sutherland and Wood Contractors, the builders of many early schools in Winnipeg including Isbister, Somerset, Gladstone and Norquay. 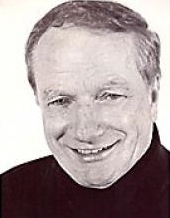 Wood, a highly-regarded and successful businessman, served on city council and the Board of Trade. Little is known about his business partner, A. C. Sutherland. he donated a drum to accompany the harmonicas. Among the illustrious alumni of Isbister School, you’ll discover Skuli Johnson (left), an early Rhodes Scholar and professor who studied history, philosophy, and classics at Oxford University and taught at the University of Manitoba. Other Isbister students include star 1912 hockey player for the Winnipeg Victorias and World War 1 hero, George Hamilton (Hammy) Baker (right) who turned down the opportunity to became a professional hockey player, and singer/comedian/good guy Pat Riordan, (left) known to many as Winnipeg’s King of Comedy for his long-standing gigs at The Zoo and The Gort. Watch Pat sing Bobby Darin’s hit Beyond the Sea. Now that Somerset School has been razed, Isbister School is especially precious because it is the last 19th century school left in the city and one of a very few left in the province. Since Isbister was one of the schools on the demolition hit list of the 1948 Reavis Report, it is even more remarkable that we still have this beautiful old place. A short feature article and picture of Beechmount can be found on my Houses page but the house and its owner richly deserve a more thorough report. A few years ago I visited Beechmount and was given an enchanting tour by its owner, Christine Common. “Someone told me before you do anything radical to a house, live in it for the four seasons of a full year,” says Christine Common, proud owner and restorer of Beechmount at 134 West Gate in Winnipeg. “Do little things the first year,” but get a personal feel for your old house before you begin the major work. She took that advice over 30 years ago. Today, Christine Common and her partner Giovanni Geremia share the wholly restored house with hundreds of people from around the world. Twenty-room Beechmount is now a four and a half star bed and breakfast. 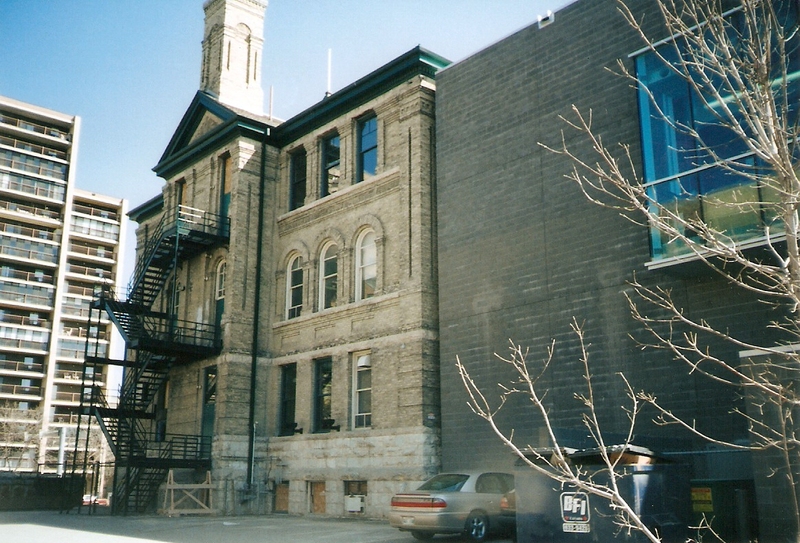 Though its adaptive reuse is modern, the house’s history connects inextricably with Winnipeg’s history. 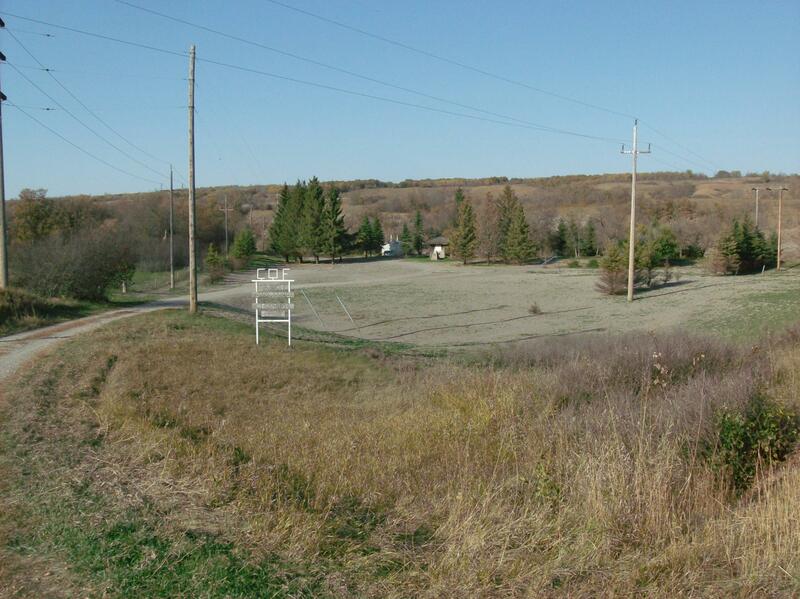 Beechmount stands on a bend in the Assiniboine River, set back from the river and street. Lendrum McMeans, a barrister and politician, built the house in 1895. He sold it to bank manager John Benning Monk who named it Beechmount after his home back in Ontario. Later in the 20th century, it became known as the J. B. Monk House. 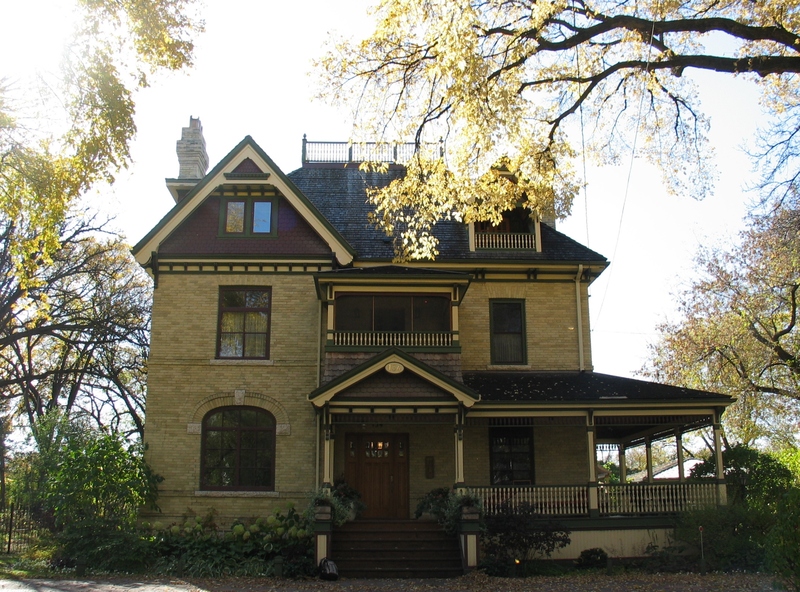 Few architectural styles are as picturesque as Queen Anne Revival, popular about 1890 to 1910 during Winnipeg’s building boom time. Broadway, its cross streets and new residential areas like Armstrong’s Point, teemed with Queen Annes sporting jaunty roofs, effusive decoration, elaborate verandahs and often, turrets or towers. Beechmount, the second house built on West Gate, is an extraordinary example of the style, rendered with class, sincerity and just a touch of whimsy. Call it genteel. Eastlake decoration, characteristic of Queen Anne style, adorns the verandah with turned spindles, finials and posts. In 1980, the house looked nothing like this. Despite the ghastly décor and unsympathetic renovation, something appealed to Common. “Even in its ugly altered state, this place had a spirituality about it that spoke to me. There was something irresistible about its spaces, something here I wanted to undertake.” The job turned out to be much bigger and longer than she imagined. 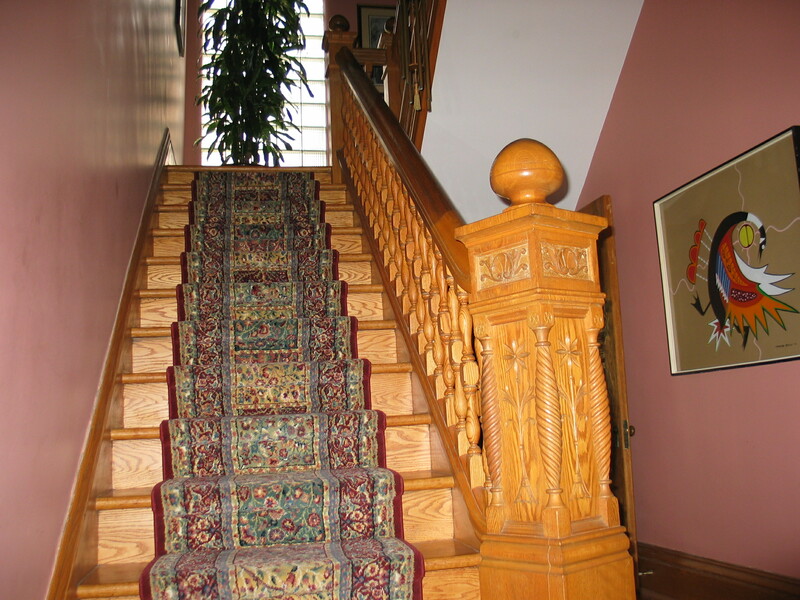 Her first project was the newel post and banister you see when you enter the house. 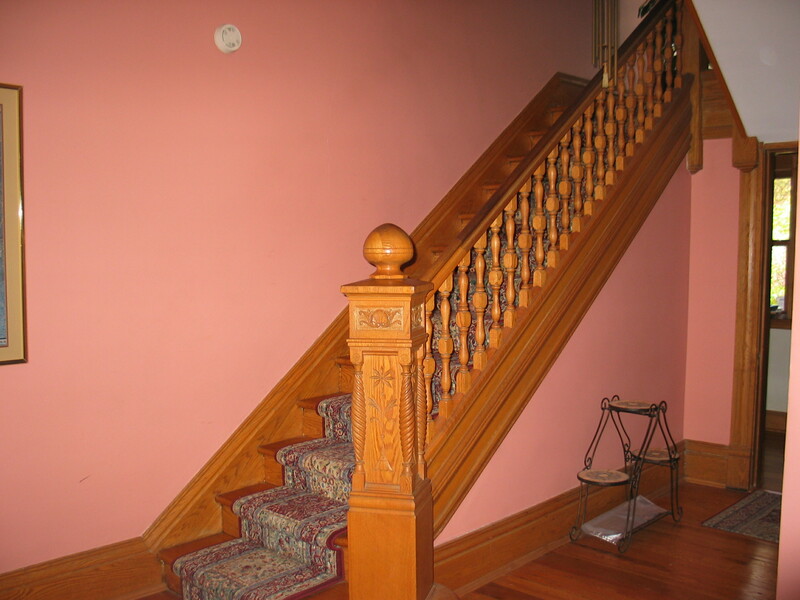 Under layers of paint, she discovered the intricate carving on the newel post and the luster of the oak handrails. It took over a year to finish that job. Thereafter it was one room at a time, starting with the dining room. “The Historic Buildings By-Law came into being about the time I started my restoration so there wasn’t much in the way of government resources available,” says Common. She consulted with U of M Faculty of Architecture, attending restoration workshops by Professor Bill Thompson. Today there are vast amounts of information, reference material and advice about heritage restoration and maintenance on the internet. The Historic Places Initiative has developed a set of Standards and Guidelines for Canadian heritage restorations along with resources for identifying, repairing and maintaining historic sites. 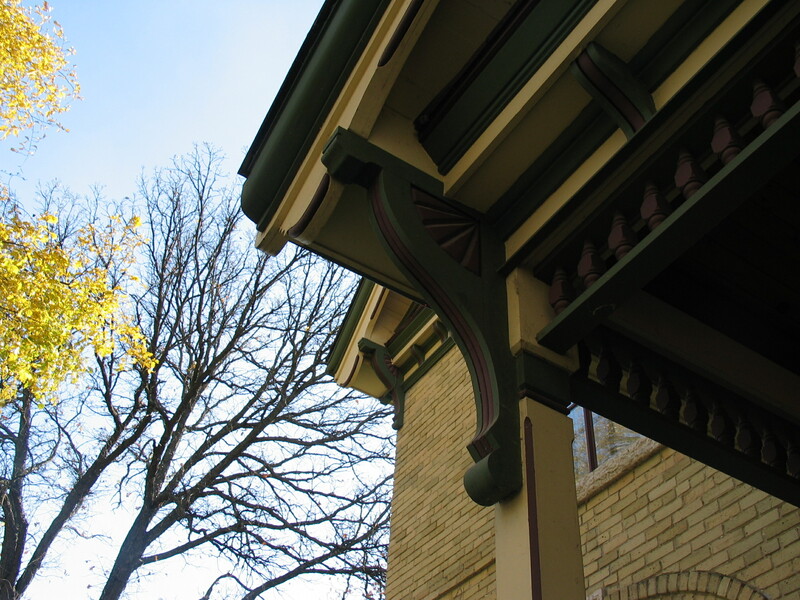 The Historic Resources Branch, part of Manitoba’s Culture, Heritage, Tourism and Sport ministry, provides advice, specific assistance and general information on conservation and maintenance to owners of heritage sites. Over the next fifteen years, besides restoring Beechmount, Common raised a family, divorced a husband and dealt with life as it arose. 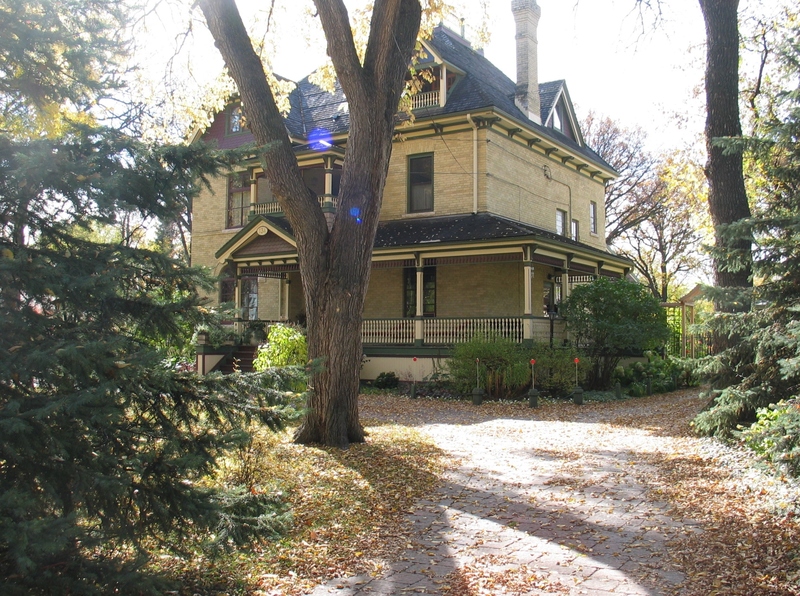 By 1995, enough of the history of the house had been unearthed and enough restoration done that the Winnipeg Historical Buildings Committee toured and decided to designate the house. Common took advantage of the new funding benefits that arise when you own a designated property and started on the “serious external stuff” such as the verandah. The original verandah was torn off in 1958 to make way for concrete steps. Enough documentation existed to create replication drawings. Architect Giovanni Geremia had renovated the kitchen in the house so Common contacted him. He was thrilled to be able to draw up the verandah plans for her. Promising her “a more authentic result,” Geremia even offered to do it himself, if she wasn’t in a rush to get it done. The verandah took three years to complete but the result is spectacular. The replication is uncanny. Utterly appropriate in colour, dimensions, detailing and quality of craftsmanship, the wraparound verandah enhances the comfort and warmth of the welcoming buff brick home. It appears to have always been there. The large brackets at the gable corners of the verandah were constructed by Geremia to match the originals at the roof corners. Each contains 20 separate pieces of wood. Another exterior job restored the still-assessable widow’s walk on the roof. “Now it’s the upkeep,” says Common. Upkeep maintains both the heritage and real estate value of a property by helping ensure its distinctive character-defining elements are protected. Appropriate maintenance demonstrates pride in the accomplishments of forbearers and the personal satisfaction of fulfilling your time of stewardship. Often mentioned by site owners is the enrichment of the community and respect that maintenance creates. The heritage factor attracts lodgers. 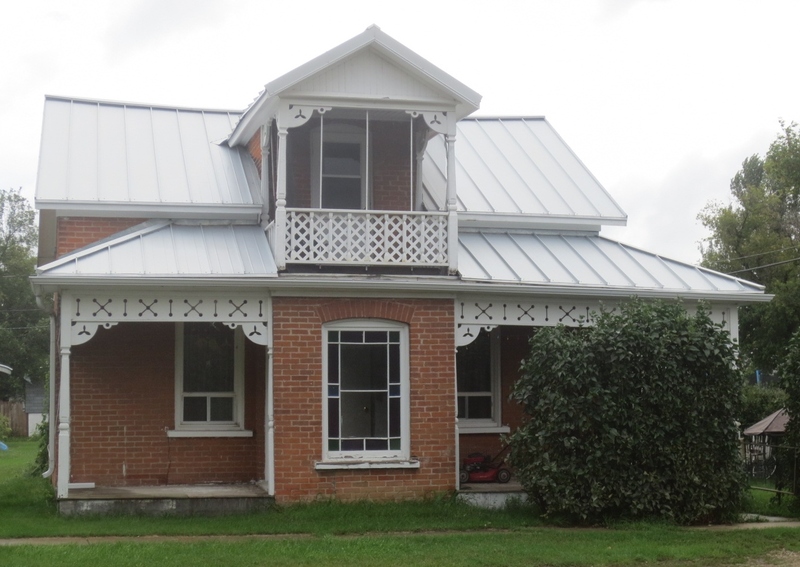 “Often people stay here because they have a connection to Armstrong’s Point or West Gate or they just like staying in old homes.” The house is included on the Canadian Register of Historic Places. As satisfying as a heritage award and designations are, Common found a visit by a 90-year old woman in 2006 equally filled with delightful affirmation. Of her love for Beechmount, Common says, “If you find a suitable old building, as English critic and author John Ruskin said, ‘You’ll find walls that are washed by the passing waves of humanity.’ You won’t find that in a new building. That is often how heritage is preserved. Satisfying feelings of accomplishment, pride and connection, a result of doing the work, inspire and expand the owner’s willingness to continue with the restoration or maintenance. The next project has the same effect, which spurs you on to the next and so on. The responsibility Christine Common feels for Beechmount stretches in both directions from the present. It respects the origins and architecture of the building, its history and all the lives lived within it. It honours the present site with loving restoration and maintenance ensuring a significant piece of local history is preserved for future generations. Hot and windy, the temperature hit 30 degrees today (about 86 F.), amazing for early October. Something similar for the next two days before seasonal temperatures prevail. The warm weather stoked my wanderlust and I headed into southwestern Manitoba on Tuesday, doing a couple of video reports and gathering images for a large video project I’m working on. 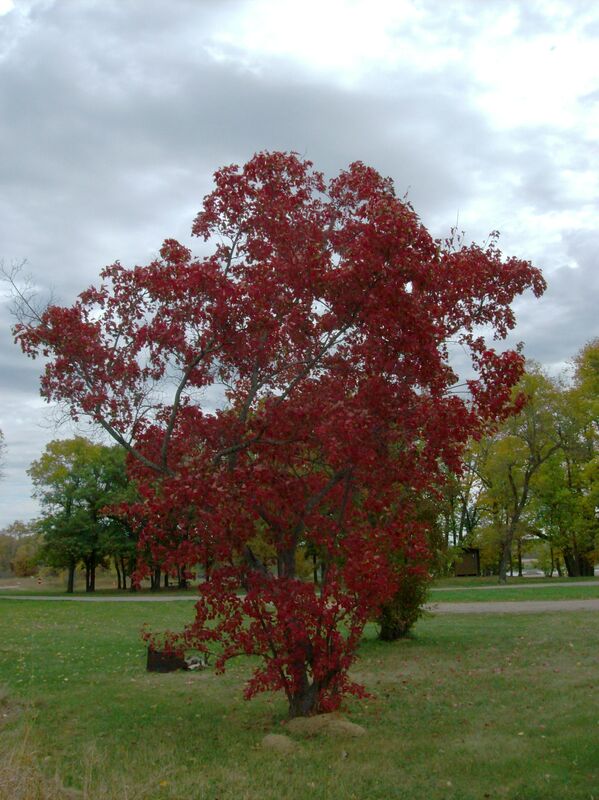 This red maple at Marsh Lake in Spruce Woods Park was in full blaze. I stopped by Campbell Lisk Heritage Park below Hwy 10 next to the Souris River. The first picture is the flooded park taken in June and the second one I took yesterday. 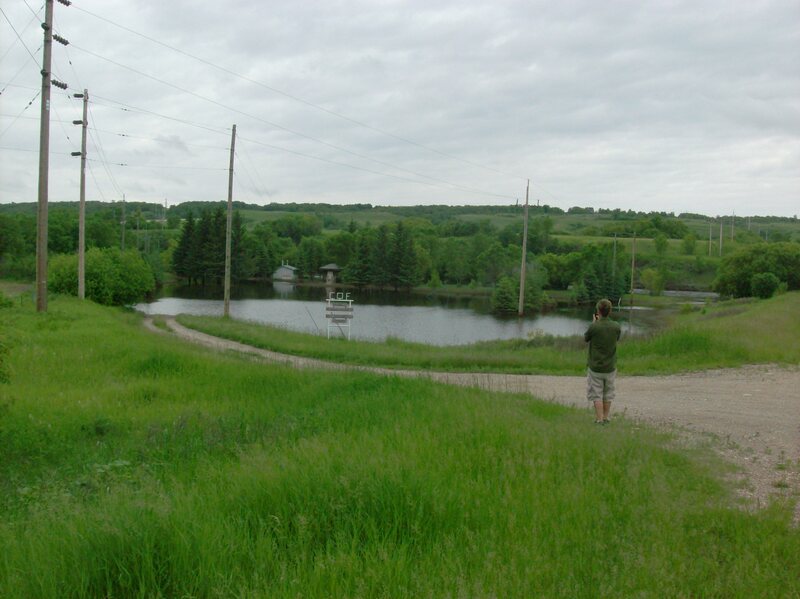 The little park, at flood peak, had over seven feet of water in it from the Souris River. Now the water is gone, the flood cake has dried out and turned into a fine grey powder that sails on every gust of wind. The vegetation has started to return; the spruce trees suffered and each is surrounded by a circle of brown dead needles, waterkill from the flooding. The other difference in the two pictures is how everything has dried out. The recent shot shows how arid we are now after a hot virtually rainless summer. I took a hike halfway around Marsh Lake in Spruce Woods Park today to survey the hiking trail. The flood cake from the flooding Assiniboine extends well back from the lake, in some places over fifty feet. The grey floodcake is dried out but several plants have asserted themselves quickly, notably grassy sedges and horsetail along the wettest parts. Further back and in the shade poison ivy, now scarlet and quite evident, flourished in the grey dry soil. Though the day was hot and sunny, I didn’t see any turtles sunning along Marsh Lake. The flood changed the ecology of the lake so it will take time to restore it or evolve into a new habitat. The turtles know what to do. I haunted some cemeteries on my drive and have some interesting epitaphs to report. In the little cemetery just outside of Margaret, MB I found these three, the first rather common but profound: Sleeping in Jesus, the comforting Under His Wings and, chiselled into an old old stone, Nevertheless he lives. In my hometown cemetery, I found the most effervescent one of the trip: She has joined the dance, the sprightly dance, the dance ever-existing. By the way, everything is up-to-date in Treherne, MB. Besides having buildings made of bottles, nice people and a pretty location, Treherne has the Birch Motel which is all mod cons as you can see! 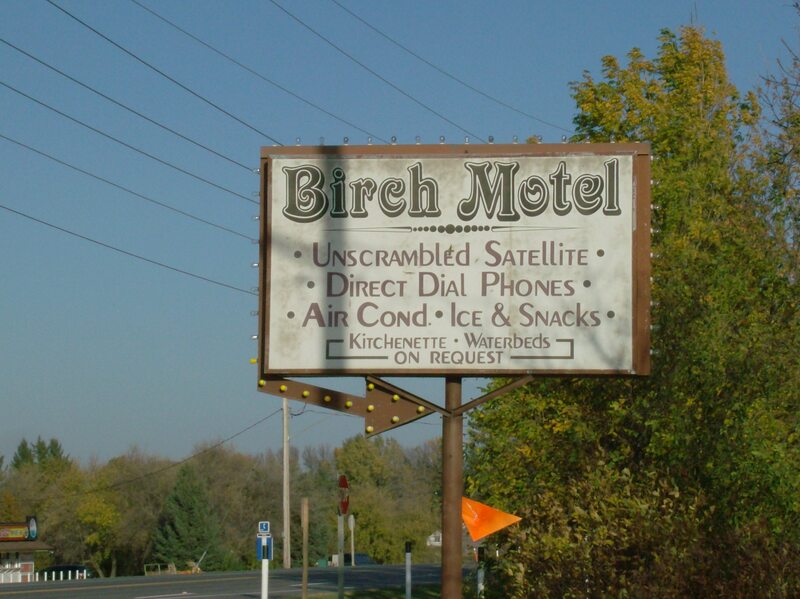 Waterbeds and direct dial phones…a little slice of heaven on Hwy 2. 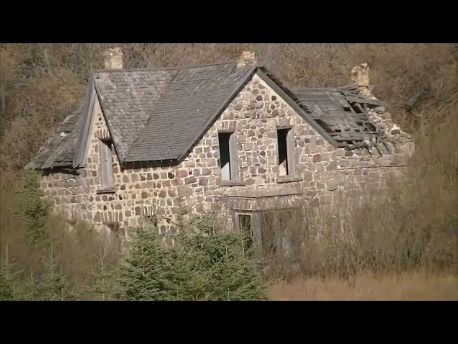 Ghost towns are appearing more frequently now. The siding of Kelloe and fading village of Solsgirth are no longer acknowledged with signs along Hwy 16. Kelloe consists of a family home with modern kids stuff in the yard and a few tumbledown houses in the bush. Solsgirth appeared to have two houses being lived in. The entire population of McConnell when I went through it this morning was two horses. Although the school, church and an old house or two survive, no people live there. Instead the people erected a cairn to signify where McConnell is/was. Apparently you can’t rely on the memories of horses for this kind of thing. Cardale was pert and mowed, the few souls it supports keep busy and wave at me. Margaret has 9 people and 30 boxes in its post office, mostly farmers. I mention to the postmistress (how quaint does that sound?) that my parents lived in Margaret when I was born and so did I until we moved to Hayfield four years later. She remembered hearing our family name in the district. I’ll end with two pictures of a delightful old weather-depainted Queen Anne style house I gaped at in Newdale today. The lovely gables with elaborate carved bargeboards and the over window and door detailing make this almost ghostly pile extra special. I wonder if it glows in the dark? It has a little satellite dish! Quiet eloquence, Queen Anne style is once again represented in this handsome brick house, one of three fine homes that grace this Brandon intersection. 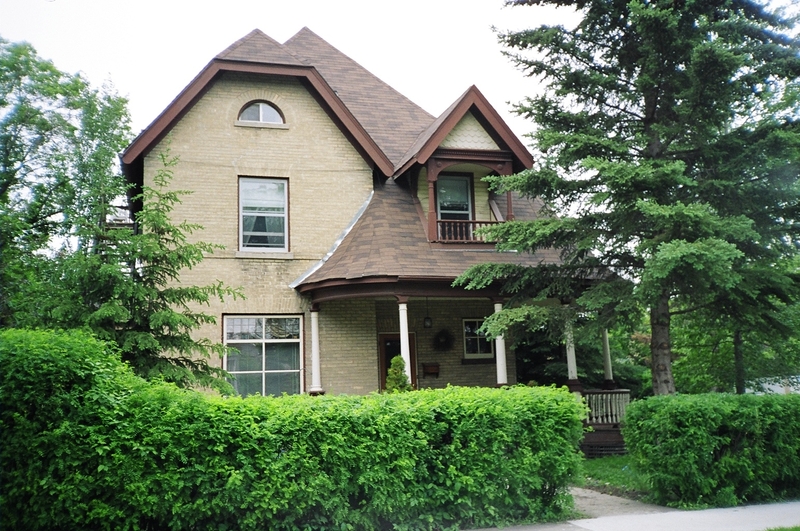 Built in 1905 for William Burchill, co-owner of Burchill and Howie Meat Market in the Burchill Block on Rosser Avenue, its roofline is distinctive with its steep hipped roof descending into the rounded porch cut with an impressive dormer and small balcony. The semi-circular window beneath the clipped gable end adds further visual interest. Every opening has a sunburst header. This house has a twin at 322 11th Street in Brandon. Boy, did I catch the right light on this Queen Anne style beauty! The detailing is rich and varied on this old house. Let‘s start at the top. The large gabled dormer on the front has dark brown shingles under the eave giving a perfect background to the elaborate and delicate bargeboard at the gable end. The medium pitched roof works wonders with the rest of the mass. On the front and sunny side of the house, the embellishments are many. Every opening has a brick label over it dripping with pendants. 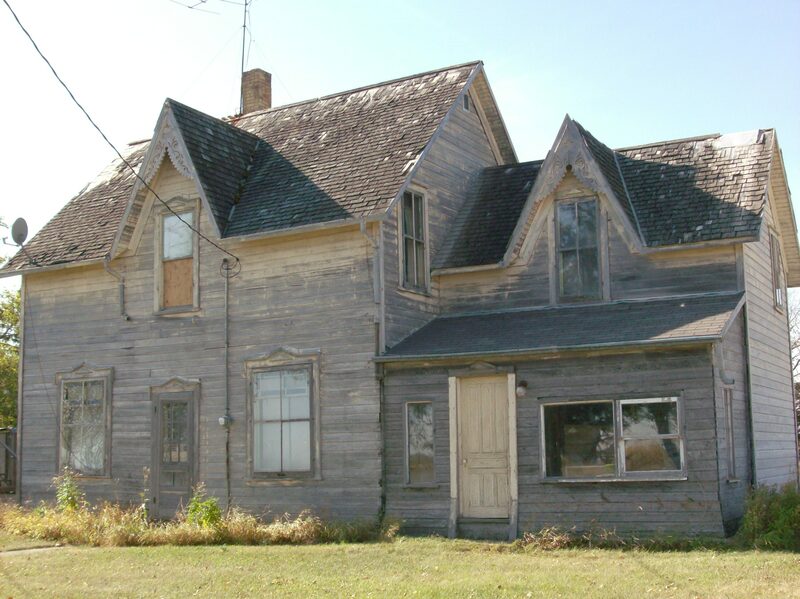 It appears there was a peaked porch over the door which would have shielded the oval window next to the door which is oddly missing its keystone. It matches the oval window between the second floor windows with its short spokes. The quoins on the corners are captured well here by the sunlight and shadow. On the shady side the window decoration is continued as are the quoins and the brick detailing. Overall brickwork is standard running bond. The main floor dissolves in the green hedge. 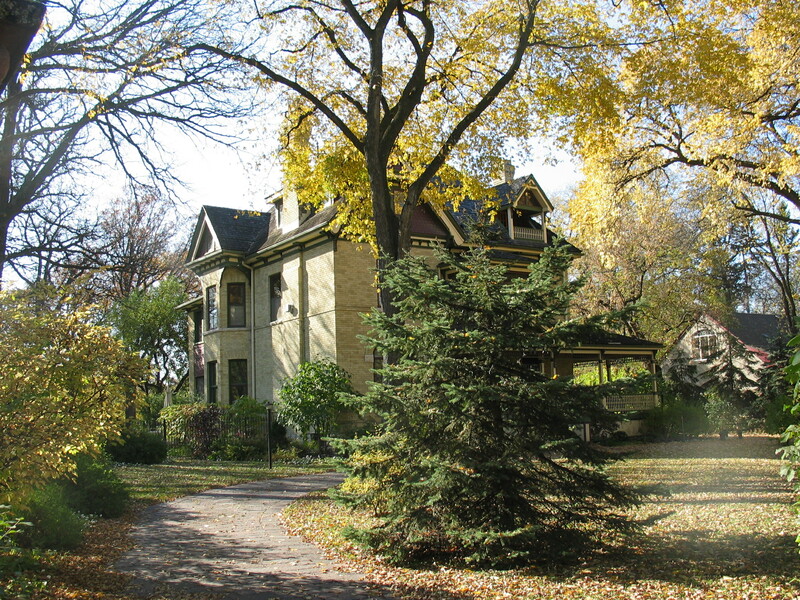 These are the same 12 Manitoba Heritage Houses on the 12 Houses page at the top. I’m making them into a post with a link to their page so as I can allow their many tags to be available online and make them easier to find. Right now WordPress doesn’t provide tags for pages, just posts. This will get around that. 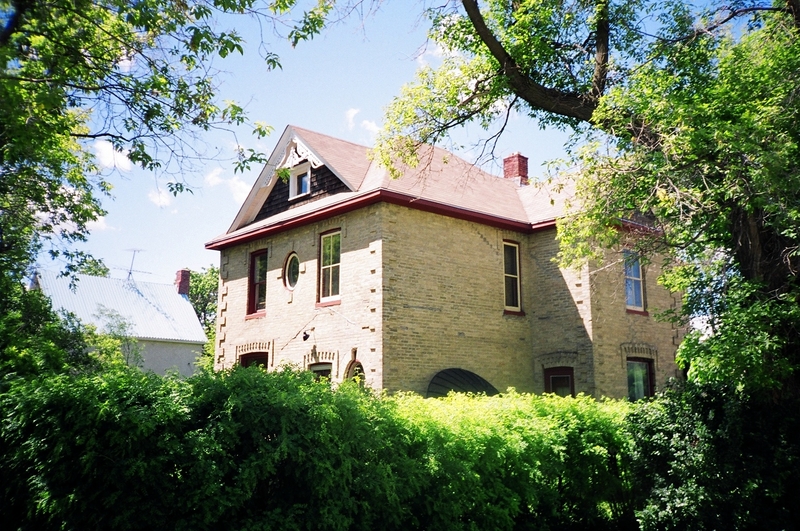 If you haven’t checked out 12 Manitoba Heritage Houses or even if you have, now is a good time. I’ve added some interesting links that weren’t there previously. This series originally appeared as a 12 Days of Christmas project Linda and I sent out in 2007 which accounts for the format. Each house merits a grand picture and short description. 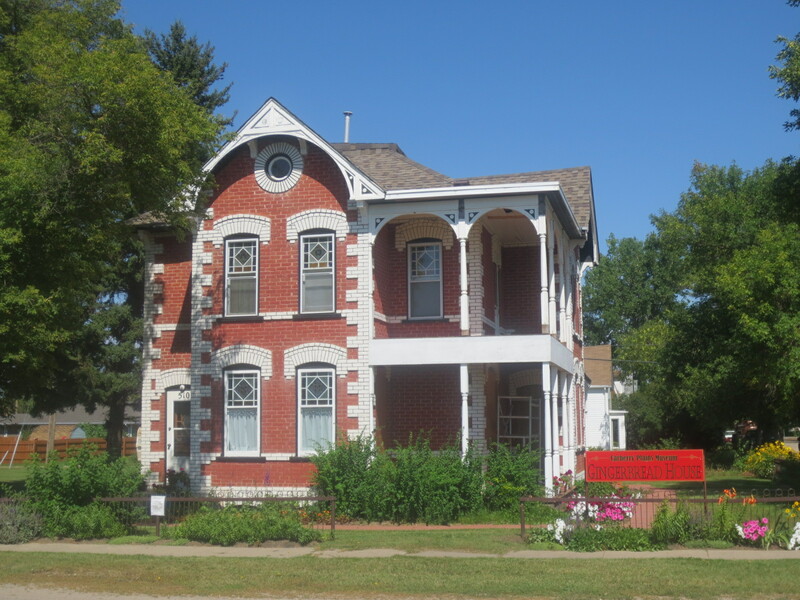 Take a drive with me around Manitoba, stopping in some delightful places and catching glimpses of twelve precious and well-maintained houses that passionately preserve our heritage. Mansard roof house, 415 Kerby St., Miami, MB. 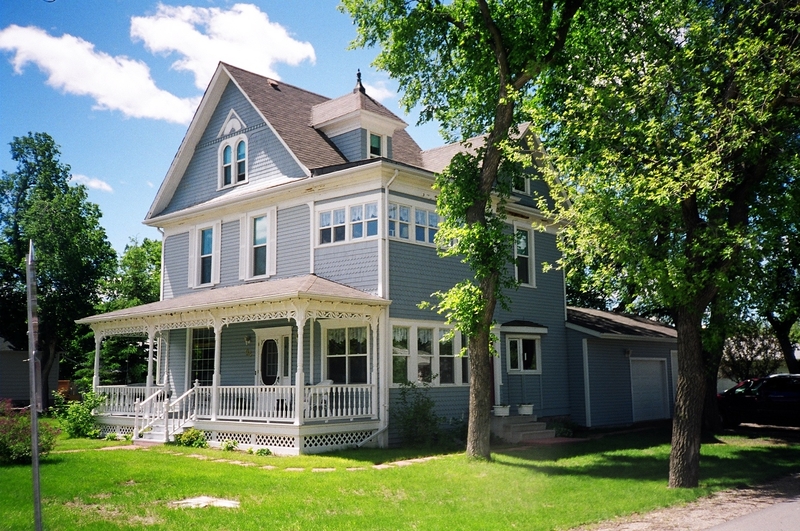 McBurney House, Third St & Fifth Ave W, Souris, MB. One & a Half Storey, Blight St, Miami, MB. Click pic to take my 3:55 tour of the 14-room house which was destroyed by arson in 2014. Click the pic to explore the house inside and out. Thanks for the memories. Always in my heart. 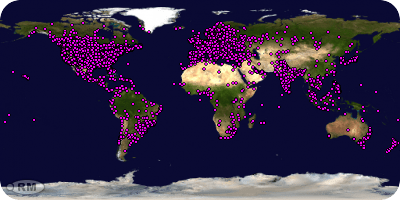 My YouTube Channel Has Over 300 Videos! 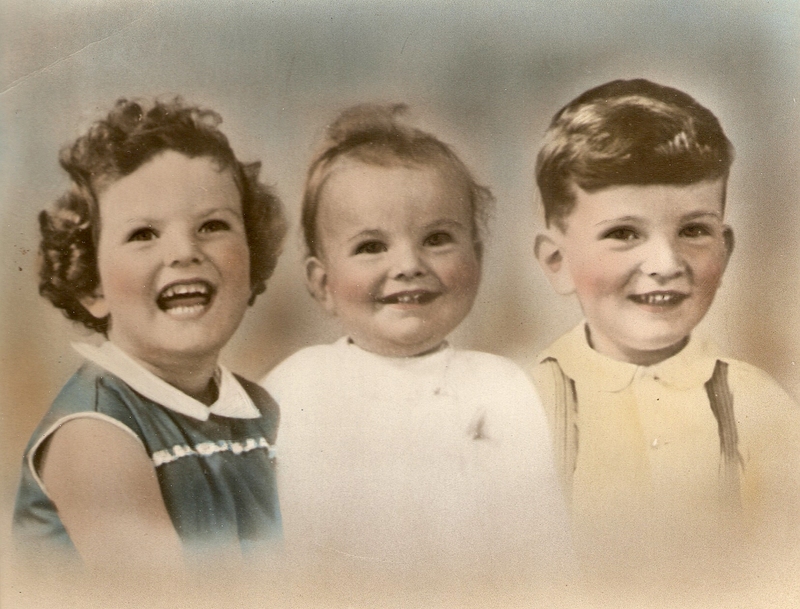 Fiction – What Ever Became of the Squareaway Children? Colloquia, Cheyenne and Grindel. Click the pic to find out. A Vickers Viscount in Garland? As a professional writer, I shall honour the strategy that informs my client’s audience in a voice they trust and a style they understand. As a personal writer, I shall honour the strategies defined by the resourcefulness of my mind, the waves of my heart and the wiles of my spirit. In the heart of Emptiness there is a mysterious impulse, mysterious because there is actually nothing in the heart of Emptiness (for there is nothing in Emptiness, period). Yet there it is, this mysterious impulse, the impulse to…create. To sing, to shine, to radiate; to send forth, reach out and celebrate; to sing and shout and walk about; to effervesce and bubble over, this mysterious exuberance in the heart of Emptiness. Emptiness empties itself of emptiness, and thus becomes Full, pregnant with all worlds, a fruition of the infinite impulse to play, hidden in the heart of your own deepest Self. If you rest in the Witness, settle back as I-I, and look very carefully for the Looker – if you turn within right now and try to see the Seer – you won’t see anything at all, for you cannot see the Seer. All you will find is a vast Freedom and Emptiness, in which the entire Kosmos is now arising. Out of the pure Emptiness that is your deepest suchness, all worlds arise. Your own impulse of looking has brought forth the universe, and here it resides in the vastness of all space which is to say, in the purity of your own primordial awareness. This has been obvious all along; this you have known all along. Just this, and nothing more, just this.